The page you're currently looking at contains information related to Redactor 1.x. Please visit FAQs for the relevant information for Redactor 2.x. How do I enable font color, font size or font family buttons in Redactor? It is not necessary to add them to your buttons configuration, just loading the plugin is sufficient. Air mode is a way to use the editor where the toolbar is hidden by default, and instead a small toolbar is shown when you have text selected. How can I set custom formatting options? Please see the Custom Formats documentation here for full instructions. Is it possible to use the MODX core media browser for selecting images? Unfortunately that is not supported currently. We are looking at providing this in a future release. Imperavi is the original developer of Redactor. 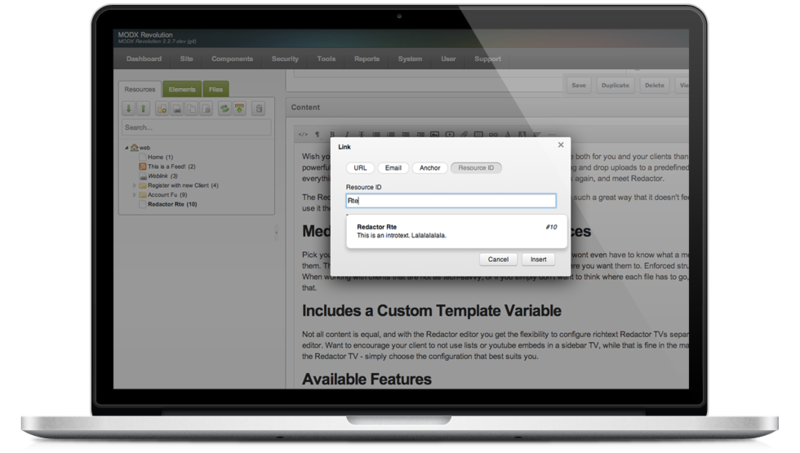 They provide it as a commercial rich text editor under various licenses. As modmore, we have purchased (and since, renewed) an OEM license which we use to provide you with a high quality MODX integration. What version of Redactor (by Imperavi) are you using right now? Redactor for MODX 1.5.x is built on top of Redactor 9.2.6. Imperavi has since released version 10 and we are working on providing a new version of Redactor for MODX based on that. Unfortunately Redactor v10 is a complete rewrite, which means we have to rewrite all of our MODX-specific fixes and customisations too. Imperavi also removed some of our clients' favourite features (including WYM mode), and we're hoping to find a solution for that. How can I add a class or ID to an image or link? To keep the editor simple, this is disabled by default. But if you need the extra possibilities, simply enable the redactor.advAttrib system setting to get some extra fields when editing an image or link. Does Redactor support front-end editing? How can I integrate Redactor in my custom component? Follow these instructions to load rich text editors, including Redactor, TinyMCE and CKEditor (since 1.3) on manager components. What is a CSS map and why is it returning a 404 Not Found? With some releases of Redactor (in particular pre-1.5) you may get an error in the Net(work) or Console tab of developer tools about a missing file: /assets/components/redactor/redactor-<version>.min.css.map. This file is a so-called CSS map and is used during development for matching compiled CSS code with the source Sass code. This makes development and styling tweaks easier for us, but has no impact whatsoever on the functioning of Redactor. The 404 Not Found error is safe to ignore.